With Readly you can read Red Arrows and thousands of other magazines on your tablet and smartphone. Get access to all with just one subscription. New releases and back issues – all included. First formed in 1964 as the official Royal Air Force Aerobatic Team, the Red Arrows have been thrilling and delighting audiences since their first performances at Clermont Ferrand and Biggin Hill in May 1965. These were to be the first of 65 team displays flown that year, not just in France and the UK, but also at events in Italy, the Netherlands, Germany and Belgium. This tremendous effort in their first year earned the team the Royal Aero Club’s prestigious Britannia Trophy for their outstanding contribution to the reputation of British aviation, setting the benchmark for the future of the team in no uncertain terms. This year sees the 50th display season flown by the team, a remarkable achievement by a remarkable group of pilots, engineers and support staff. It also sees the 40th anniversary of the first flight of the BAE SYSTEMS Hawk, the fast, agile and supremely reliable advanced jet trainer that has been the team’s aircraft since 1980 and is still in production in advanced versions today. The Red Arrows and their Hawks have presented the finest in British aviation prowess to the world, performing over 4,500 displays in 54 countries across the globe. The team not only display the professionalism of the Royal Air Force and the quality of the British aviation industry, but also act in the role as ambassadors for the United Kingdom, developing and maintaining friendships with the many nations they visit. Unprecedented access to the team’s archives has enabled a year by year history of the team to form the centre of the publication, featuring the highlights of each year and the famous people who have visited the team, from the Royal family to famous sportsmen and celebrities. The Red Arrows themselves are providing an insider’s view of life with the team, showing the work involved in their superb displays from both the pilots and engineers perspectives. The aircraft are examined in detail as are the manoeuvres and formations that go to make up the excitement that is a Red Arrows display. 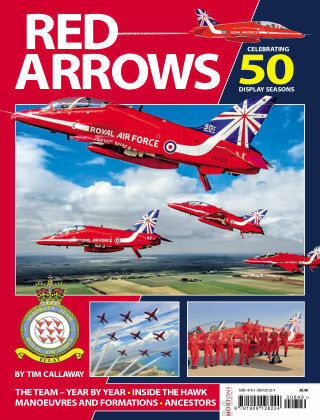 The Red Arrows – celebrating 50 display seasons will take the reader inside the last 50 years of precision aerobatics, revealing the work of the team in a unique and fascinating way and commemorating half a century of British excellence.